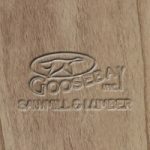 Paulownia Marine Plywood - Goosebay Sawmill and Lumber, Inc.
Update March 11, 2019: This item is out of stock and unavailable. Our usual supplier is also out of stock. We are working on locating a new supplier. You may consider using 3mm Okoume Marine Plywood. Paulownia marine plywood is rotary cut. Paulownia is prized for its superior strength and very light weight. This product is used in marine applications where weight is of great concern, particularly in building wood surfboards. Marine plywood, like any plywood, it is made up of several thin layers of veneer or laminates. The layers of wood used in marine plywood are not treated to be rot resistant. The glues used to hold the laminates together are water proof. This means that if the plywood is exposed to dampness or water that it will be less likely to delaminate. It is very important to tightly seal the edges of the plywood. It is expected that the plywood will be finished in its final applications. No special orders. Paulownia marine plywood is available to us in limited quantities and we do our best to keep it in stock at our facility. Update March 11, 2019: This item is out of stock and unavailable. Our usual supplier is also out of stock. We are working on locating a new supplier.